Prevue pet products naturals coco hideaway with ladder bird toy 62801 is handmade from 100-percent natural, eco-friendly, materials providing your bird with mental stimulation and rugged physical play. 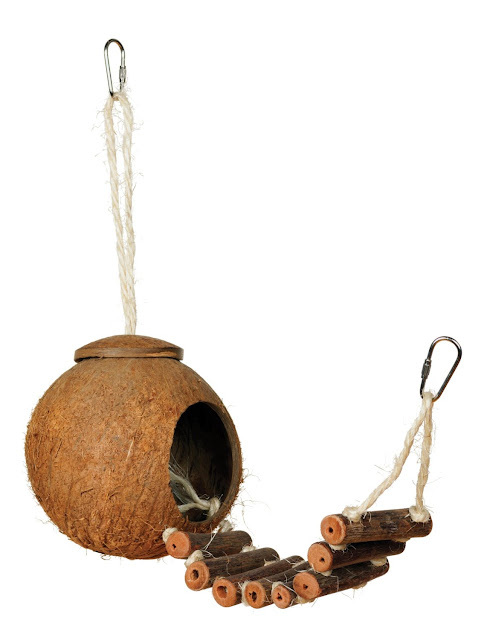 Made with hevea wood branches, coconut shell and natural sisal rope this bird toy encourages foot and beak exercise. Toy connects easily to cage with quick-link attachments and is hand made – actual measurements may vary slightly. as always, supervise birds at play. Our naturals coco hideaway with ladder bird toy is approximately 12-inch long and 4 1/2-inch wide, ideal for small to medium sized birds.